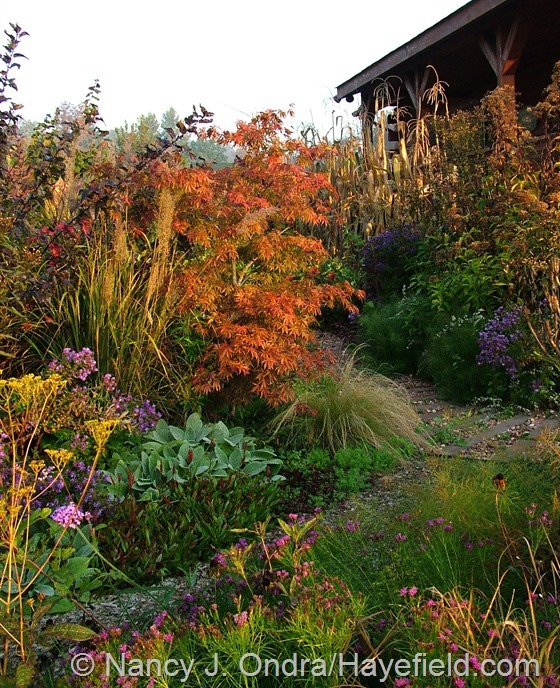 It’s that time again: time for The Fall Color Project, hosted by Dave at Growing The Home Garden. I’ve been participating for six years now, and it’s been interesting to look back and see what’s different and what’s pretty much the same from year to year. 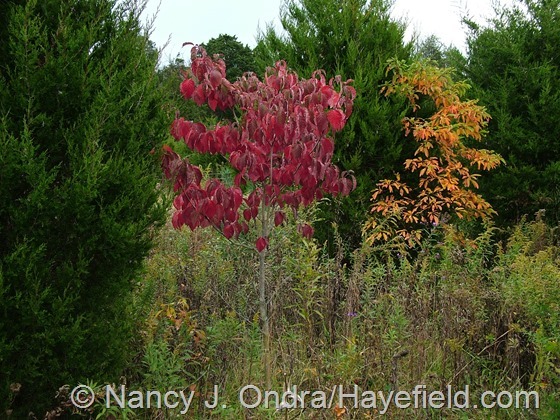 The biggest difference, I think, is that I no longer have to set foot outside of Hayefield to find fall color from some nice deciduous trees and shrubs. Granted, they’re not very *big* trees, but these lovely volunteers out in the meadow are finally taller than me, at least. 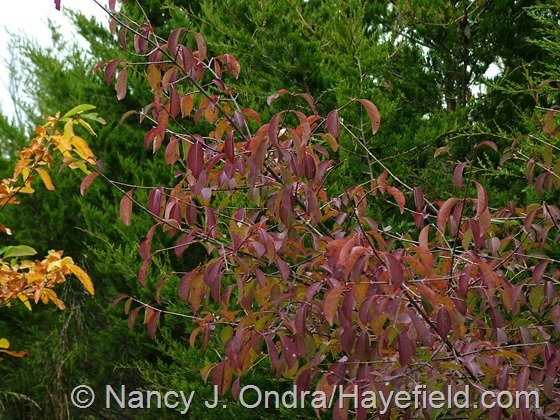 Above is an eastern flowering dogwood (Cornus florida), and below is a sassafras (Sassafras albidum). Not surprisingly, I find many gems like these coming up snug against the red cedars (Juniperus virginiana), where birds like to hide and finish digesting their food in peace. Nannyberry (Viburnum lentago, below) isn’t the most elegant of native shrubs, especially when it has to fight its way out from under cedars, but it’s generally very good for fall color around here, ranging from purplish red to deep purple. 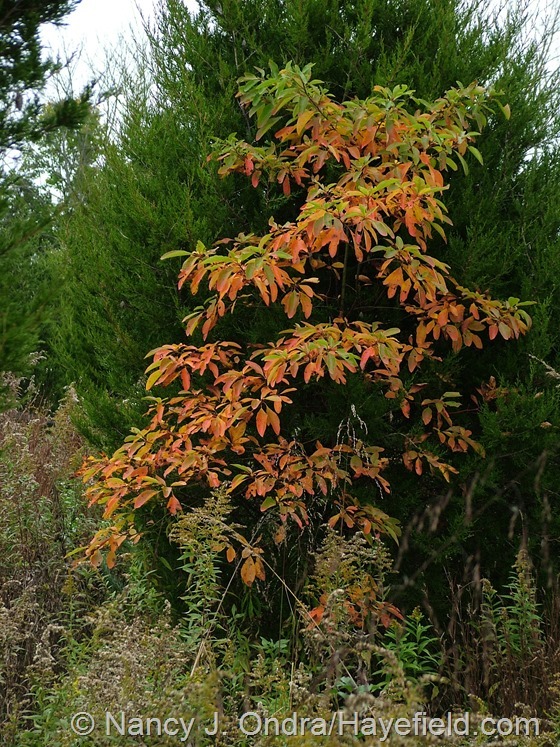 Not all of the best fall-color woodies around here have come up on their own, of course. I can take some credit for planting the three-flowered maple (Acer triflorum)—above with Arkansas bluestar (Amsonia hubrichtii)—and stewartia (Stewartia pseudocamellia, I think). 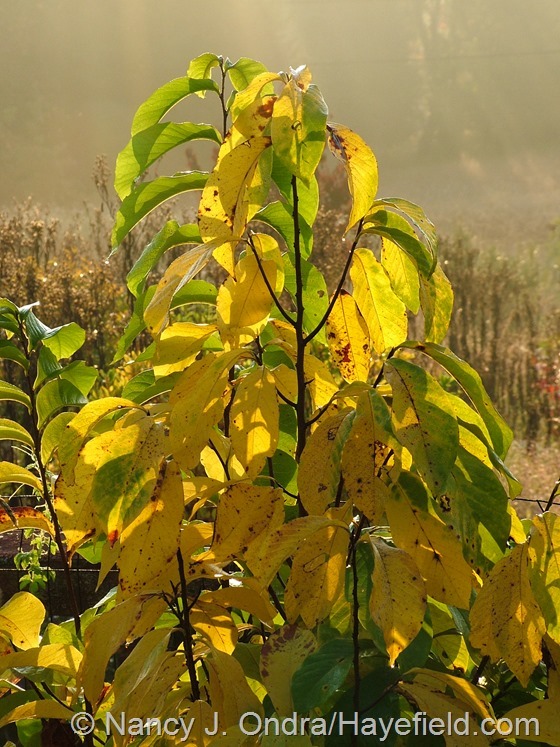 I actually have two stewartia seedlings planted out in the meadow, but the other one isn’t nearly as spectacular as this one. 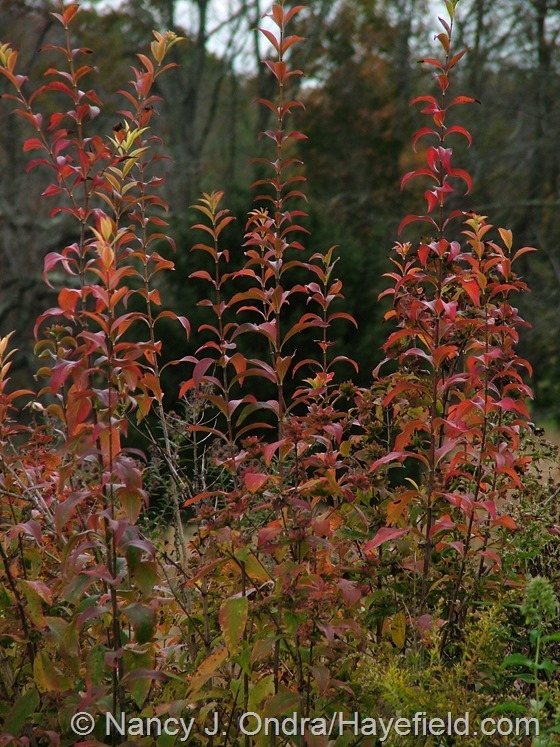 Above is Virginia sweetspire (Itea virginica), which is always a sure bet for great red fall color. Below is ‘Issai’ purple beautyberry (Callicarpa dichotoma). The yellowish fall color isn’t spectacular, but it does help to show off the abundance of clustered berries. The rich perfume of fragrant abelia (Abelia mosanensis) flowers is reason enough to grow it, but it lasts only a couple of weeks in late spring. 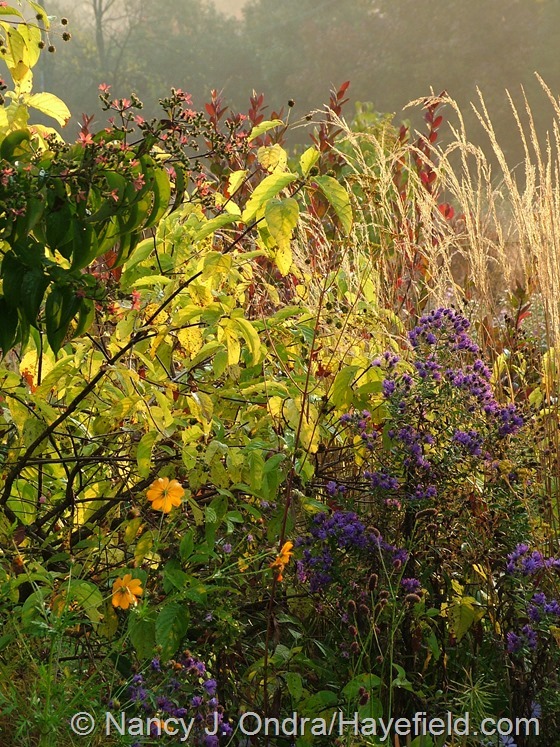 The outstanding fall display is around even longer, a bonus that makes it even more worth the space it takes up. Autumn color—a bright greenish yellow, in this case—is a nice extra feature on buttonbush (Cephalanthus occidentalis), too. 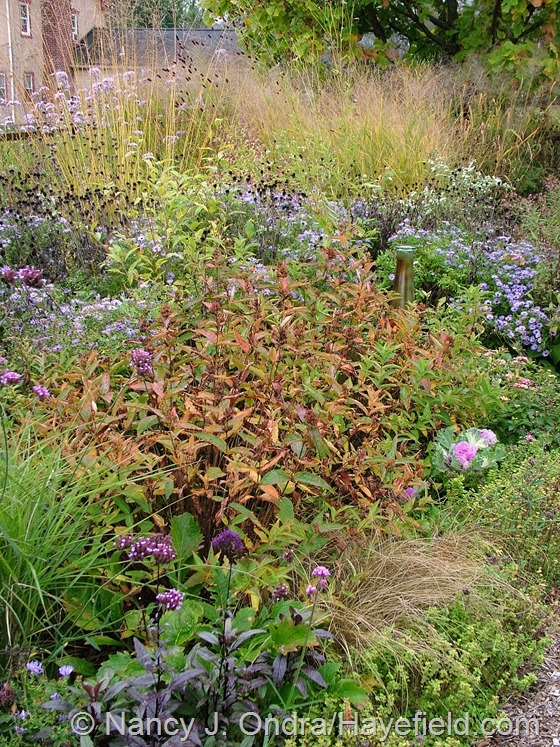 Below, it’s with seven-sons tree (Heptacodium miconioides) and ‘Hella Lacy’ New England aster (Symphyotrichum novae-angliae). 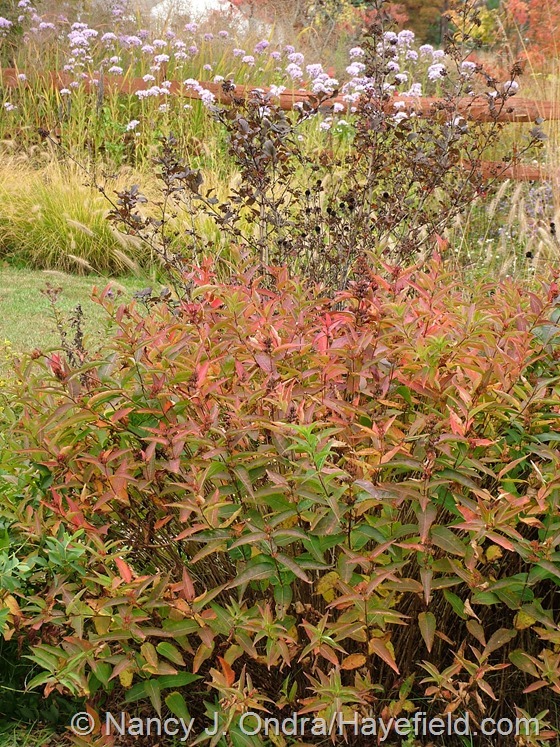 ‘Grace’ smokebush (Cotinus), above, is just now turning from its purplish red summer color to its glowing red fall display. It’s also a bit early for the best color on southern bush honeysuckle (Diervilla sessilifolia), below. It would be easy to do a whole fall-color post on viburnums, but I decided to choose just this one—Blue Muffin arrowwood viburnum (Viburnum dentatum ‘Christom’)—to also celebrate the Red Sprite winterberries (Ilex verticillata ‘Nana’). They set fruit for the first time this year, thanks to a nearby pollenizer (‘Jim Dandy’) finally reaching flowering size. Below is one of my carefully nurtured pawpaws (Asimina triloba). 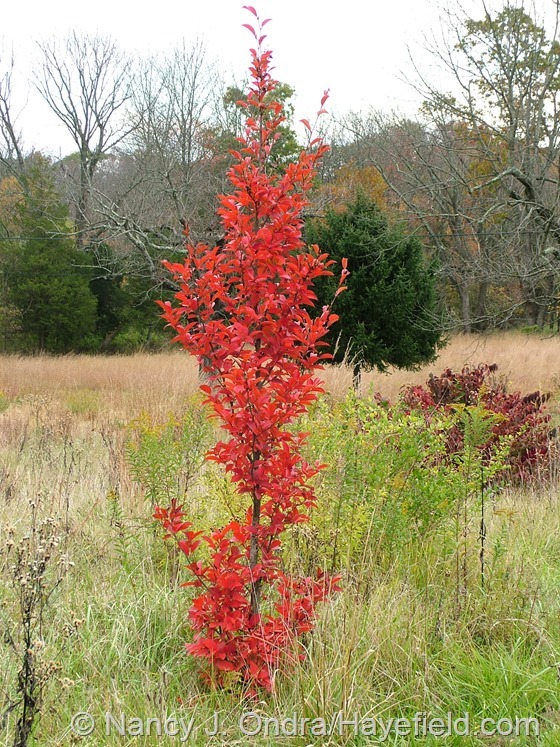 It’s just as tall as I am now and is proudly displaying its splendid yellow fall foliage. And below, even more spectacular fall color on a native that needs no pampering: Virginia creeper (Parthenocissus quinquefolia). 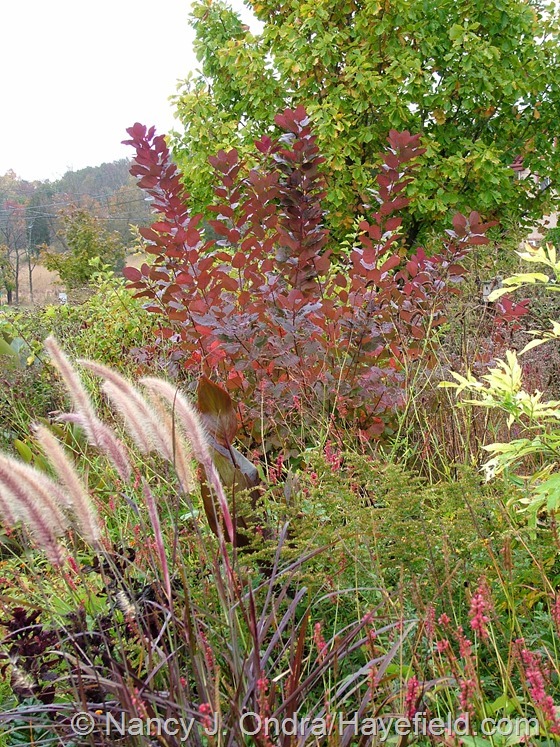 That’s not a bad showing from the woody plants, but as usual, the best color around here comes from the diversity of perennials and grasses. ‘Freya’ lily (Lilium) looked so good even after she dropped her petals that I never bothered to trim off her seedheads, and she’s contributing an extra touch of interest now with her yellowing leaves. 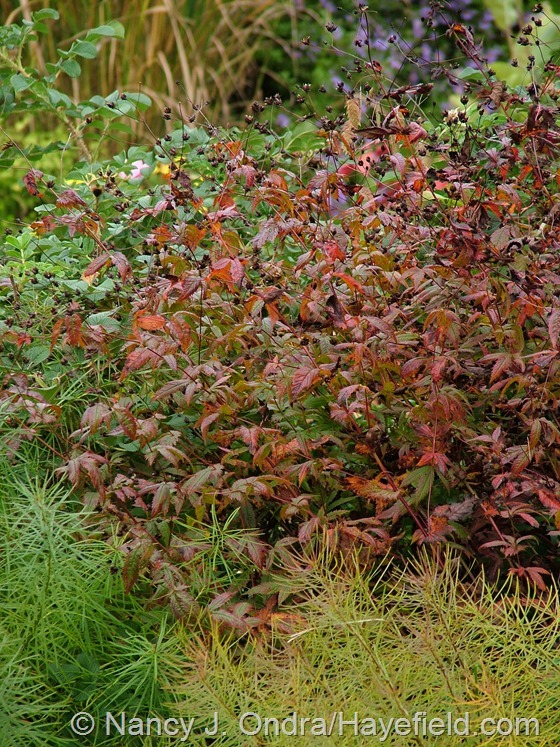 American ipecac or Indian physic (Porteranthus stipulatus), above, is always superb for fall reds, as is dwarf fleeceflower (Persicaria affinis), below. 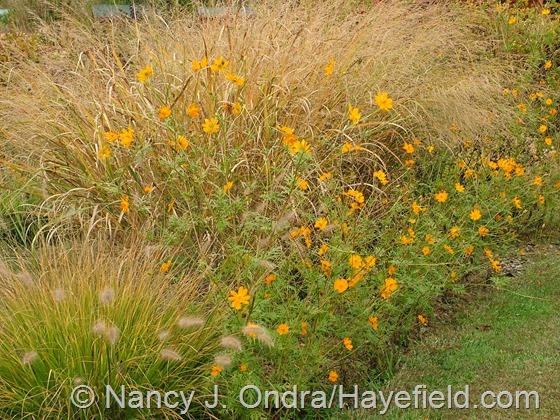 I always think of Arkansas bluestar (Amsonia hubrichtii) as having yellow fall color, but it can also develop shades of orange and reddish purple. That’s true of balloon flower (Platycodon grandiflorus), too. 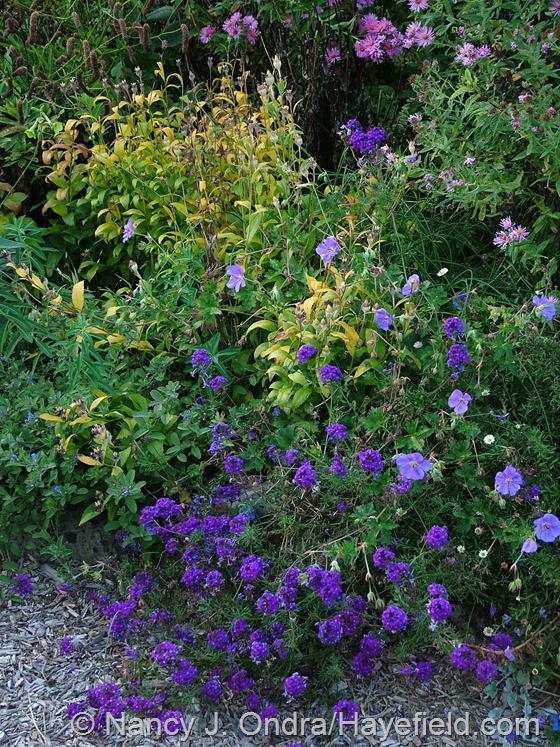 Below is ‘Axminster Streaked’ just starting to turn color, with ‘Jolly Bee’ geranium and ‘Imagination’ verbena. 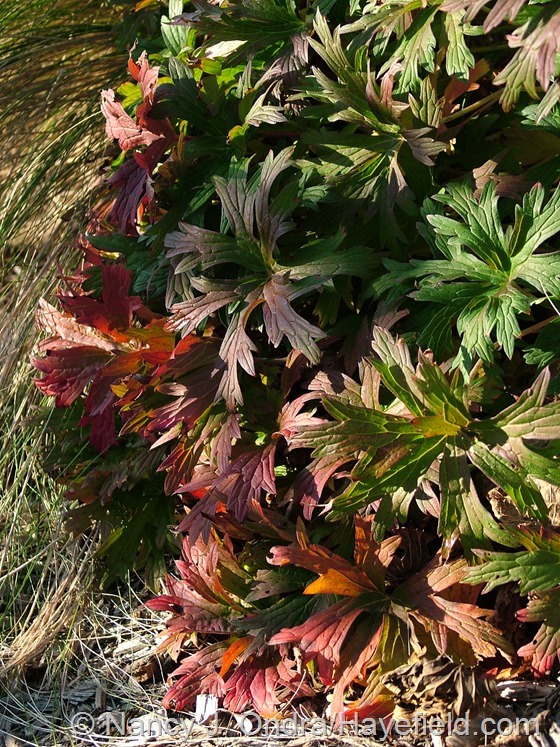 Speaking of hardy geraniums (Geranium), they too can produce an exceptional fall show; so far, though, only ‘Brookside’ (above) is starting to turn. 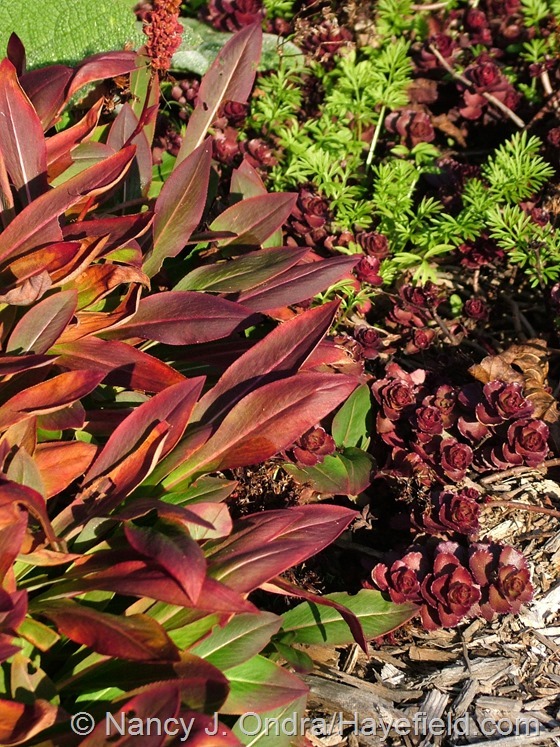 ‘Elizabeth’ two-row sedum (Sedum spurium), below, has a reddish blush through the summer, but the color becomes much more intense when cool weather returns. 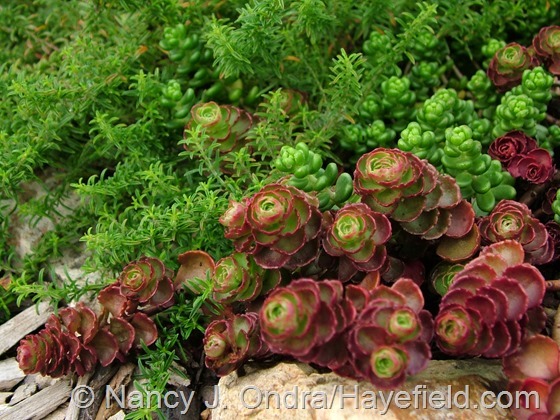 Below it’s with Sedum oreganum and creeping winter savory (Satureja montana subsp. illyria). 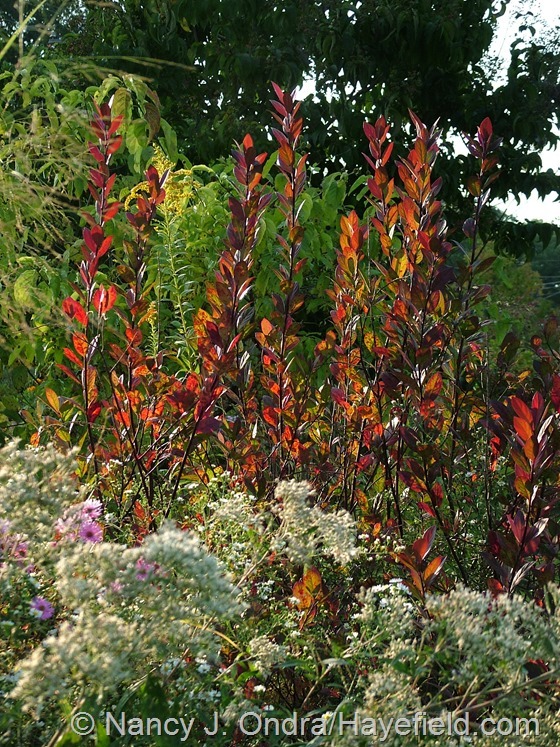 Fall color isn’t a common feature of annuals, but cool temperatures can sometimes help to intensify their leaves. 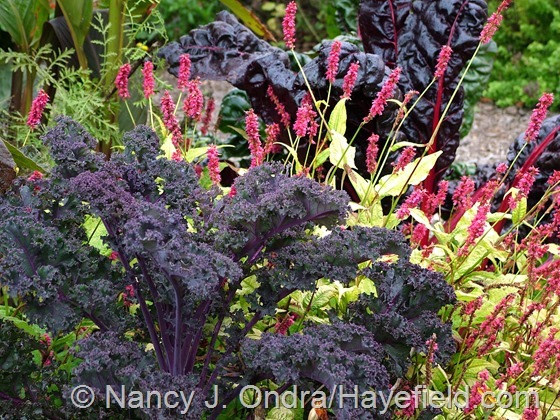 Both ‘Redbor’ kale and ‘Black Knight’ blue throatwort (Trachelium caeruleum) tend to be purplish green through the summer but turn a very rich purple in early to mid-fall. 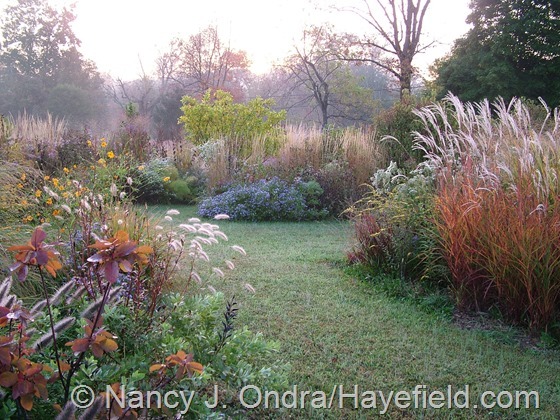 You can’t talk about fall color from herbaceous plants without exploring ornamental grasses, of course. 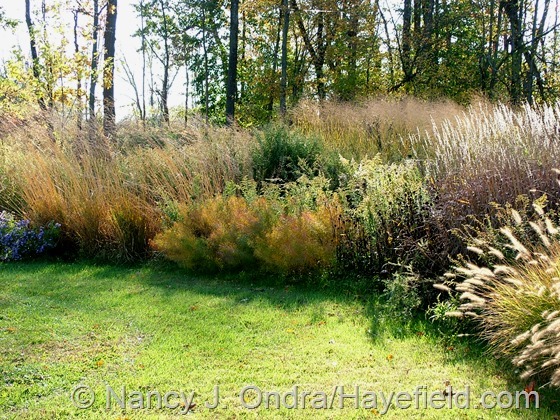 Frost grass (Spodiopogon sibiricus), above, doesn’t have the most spectacular color change, but it’s a nice orangey gold most years. Flame grass (Miscanthus ‘Purpurascens’), on the other hand, is almost always an eye-catcher, with vibrant oranges and reds in full sun and pretty pastel tints in a bit of shade. 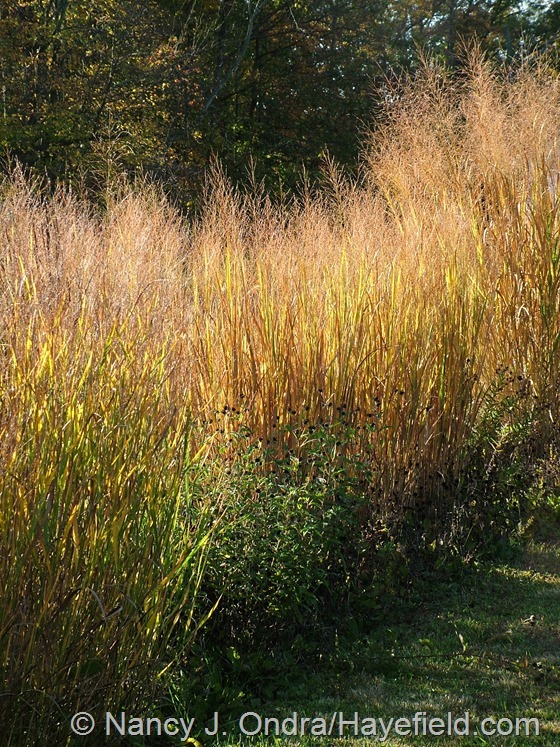 Switch grasses (Panicum virgatum) are practically must-haves for fall color. Above is tall ‘Huron Solstice’, topping out at 5 to 6 feet here; below is ‘Cheyenne Sky’, which reaches only about 3 feet tall. 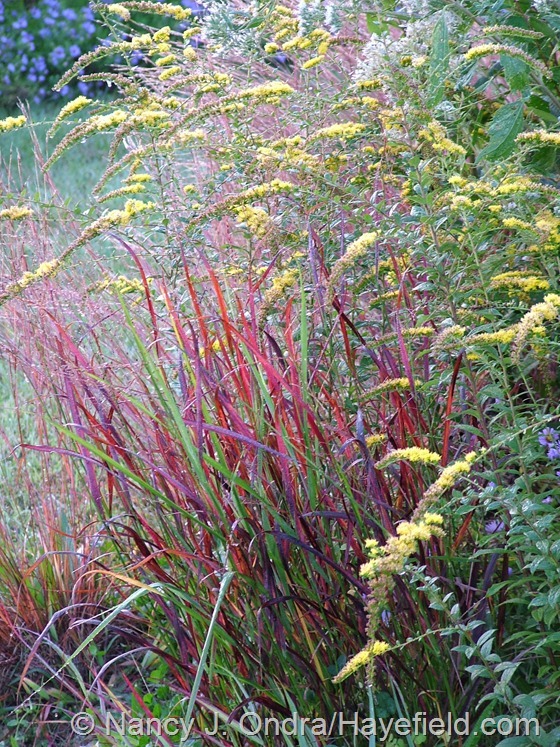 These are my two top favorites of the red switch grasses. 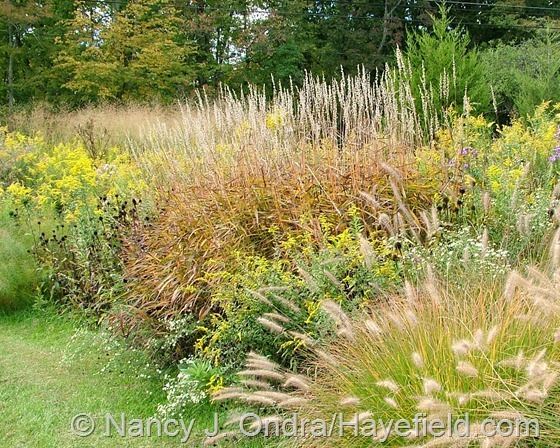 Several other switch grasses turn shades of yellow. 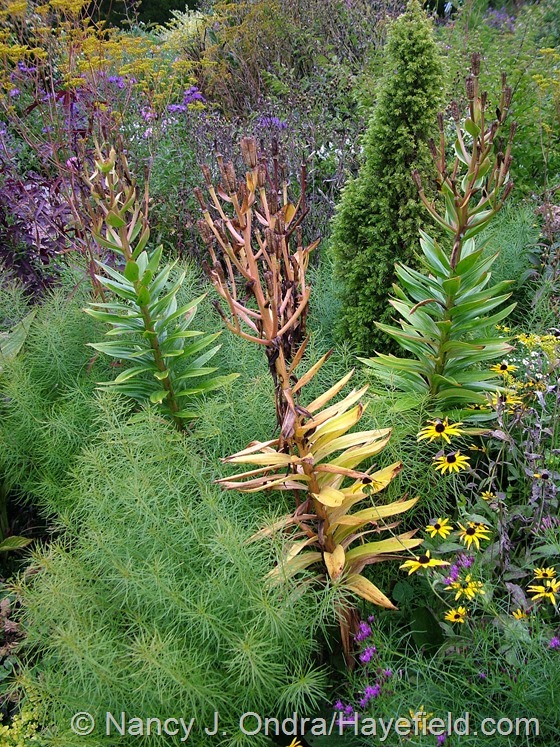 ‘Northwind”, above, is my favorite for both its distinctly upright habit and its bright fall display. 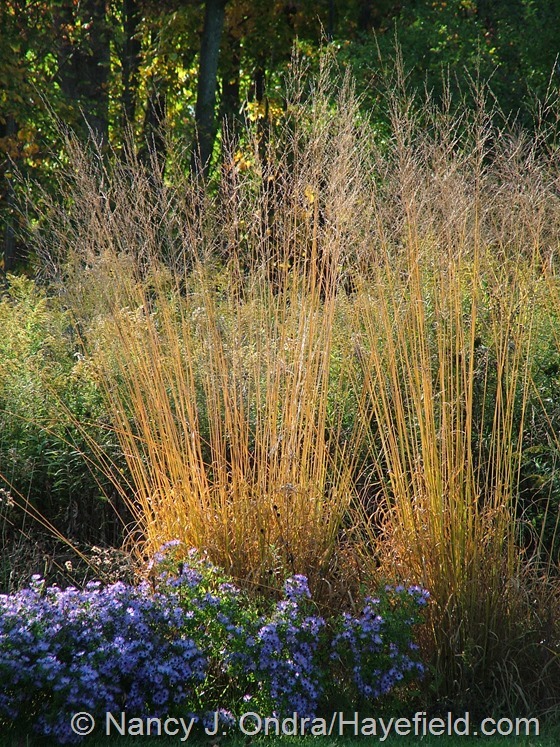 ‘Dewey Blue’ bitter panic grass (Panicum amarum) is a duller greenish yellow, but it makes a distinctive contribution to the fall garden with its arching ( to sometimes sprawling) habit and hazy cloud of seedheads. Below, it’s behind sulphur cosmos (Cosmos sulphureus). 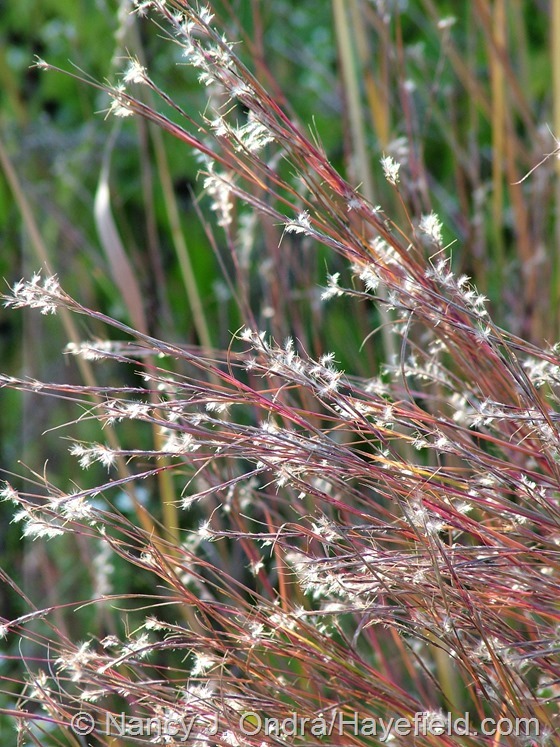 Little bluestem (Schizachyrium scoparium), above, varies in fall color from clump to clump: some are purplish red, some are coppery orange, and some are rusty brown. All of the colors are nice, but what I like even better is the way that their silvery seed tufts catch the sunlight. As you may have noticed, I have a *lot* of ‘Cassian’ fountain grass (Pennisetum alopecuroides) around here: the legacy of an initial purchase of a dozen plants when I started the courtyard garden. Since then, I’ve divided them many times, so they’re now in many parts of the garden and The Shrubbery and really stand out at this time of year. These ‘Skyracer’ purple moor grass (Molinia caerulea) clumps out in the Arc Borders tend to blend in for most of the growing season, but you can’t miss them at this time of year, especially with the late afternoon light illuminating them. 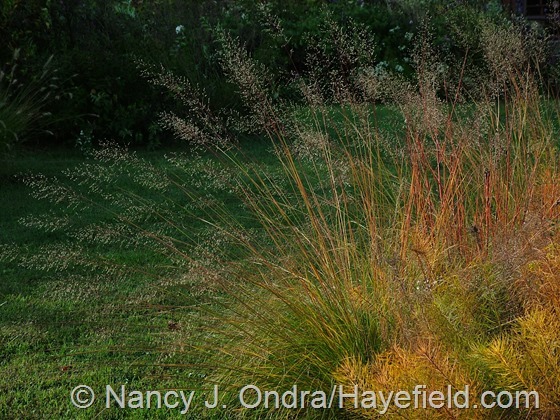 Prairie dropseed (Sporobolus heterolepis) is just now starting to develop its orangey color, but it too shows off beautifully in the low-angled light. 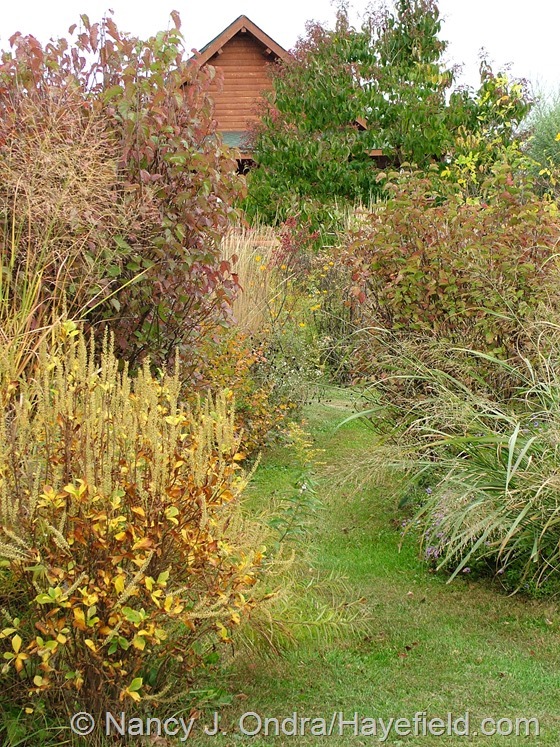 And certainly, a gallery of great autumn grass colors wouldn’t be complete without the brilliant red of Japanese blood grass (Imperata cylindrica ‘Rubra’), below with a no-name Japanese maple (Acer palmatum), ‘Gerald Darby’ iris (Iris x robusta), ‘Hella Lacy’ New England aster (Symphyotrichum novae-angliae), and Tropicanna canna (canna ‘Phasion’). 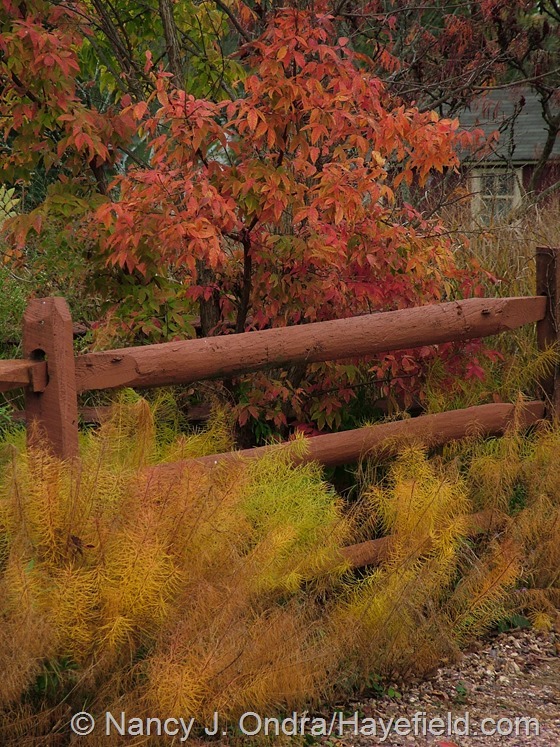 If you have some fall color photos of your own to share, you can post a link at the Fall Color Project at Growing the Home Garden. Before you go, though: for those of you interested in seeds, remember that I’ll be posting this year’s list on November 15th. I’m asking for all requests to be in by November 25th, so make sure you visit early. The list is rather more extensive this year, so it may take you a while to go through it all! 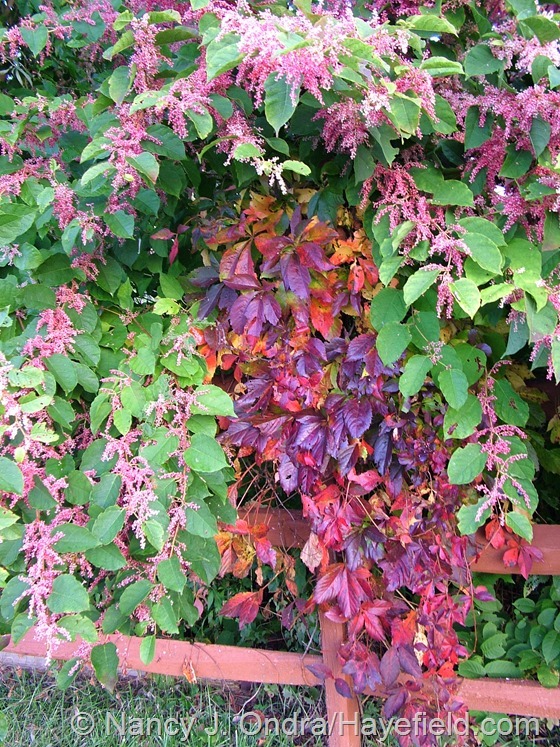 Love plants with colours, so I think the fall colours ore very importent. I have make notes on several species and hope I can find them here in Sweden! Thank you for checking in this morning, Susie. You’re always one of the first readers for any new post. I hope you’ve been enjoying some lovely fall colors in your own part of the world, and I’m happy to have been able to show you some new possibilities. Have a great day! so beautifull … I am speechless ! 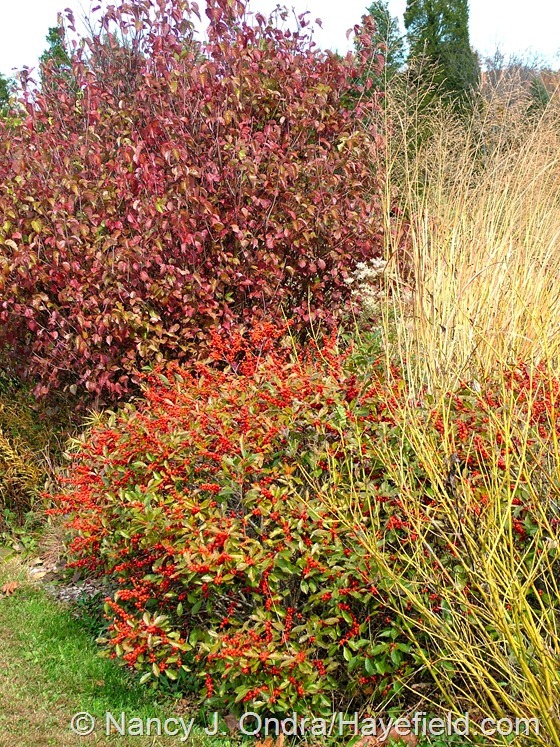 these fall colours become more and more important in our gardens, as they “replace” the summer flowers , and also make statementsin the garden, instead of … nothing ! 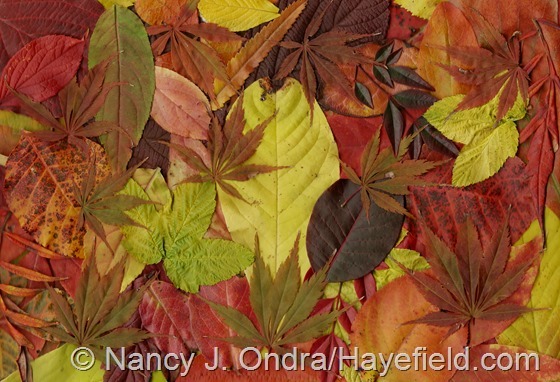 It’s challenging to plan for fall color, because the weather plays such a big part in which colors develop and when. But you’re right: it’s a nice bonus that softens the blow of the first frost and the end of the growing season. very true, Nancy ! 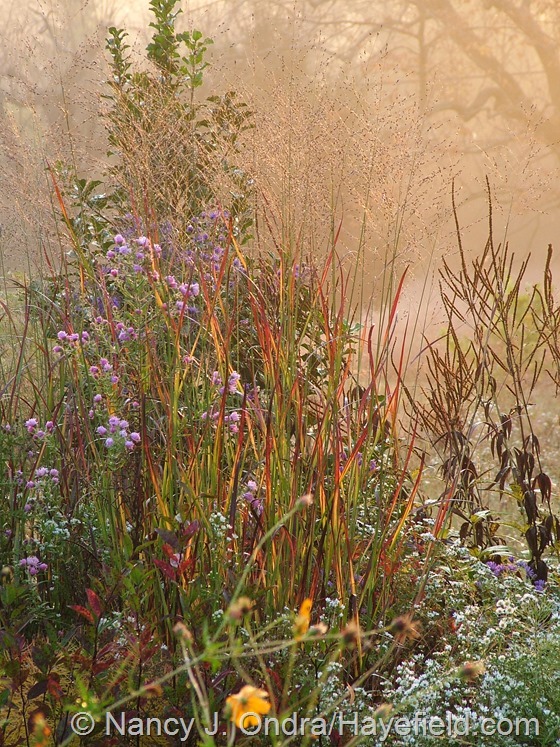 I live near Paris, which is expanding towards the countryside, and grasses have been used in large drifts all along the new roads, this year the vision of all the colours is really astonishig ! we have a rather damp automn, and it makes these colours very bright and almost shining! Lucky you – it’s been very dry here for the past two months, so I figure that we were very lucky to get any nice colors at all. Enjoy your glorious autumn! I hope that you’ve been able to enjoy a spectacular fall in your own area too, Jean. Nurturing your pawpaws ;) Just you wait and see. I planted a cultivar and a seedling less then ten years ago. They were slow to start as well, but now the seedling is huge, the cultivar maybe half that size but the two have already managed to produce huge amounts of fruit and a little grove, They also get visited by my local bear regularly who shares in the fallen bounty :) On a sidenote: pawpaws are virtually deerproof and grow happily next to black walnuts. Love your blog and your garden! I am *so* looking forward to a little grove of my own! I’ve bought 8 or 10 of them in deep pots, and started over a dozen of them myself, over the last decade, and it’s finally this year that I have three that look very promising. In another year or two, they will be too big for me to cover them when late spring frosts come, so then they’ll be on their own. I can do without attracting bears, though! Superb as always. 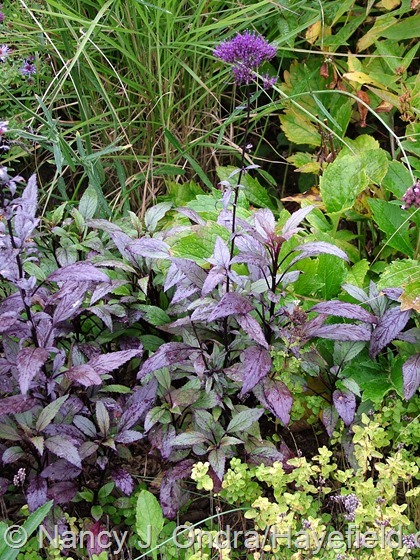 Is the Trachelium caeruleum hardy for you? It didn’t survive over winter the last time I grew it, Julie; in fact, I didn’t realize until I was checking the name for this post that it can be hardy to Zone 7. I’m not quite that warm here yet, so I may try bringing some of the plants indoors. I couldn’t resist trying a few collages again this year, Sue. I could imagine the neighbors thinking I’m crazier then usual as I was walking around picking individual leaves, inspecting them carefully, and then putting them in my harvest basket. Or maybe they’re just used to me doing inexplicable things by now. Have fun with your garden cleanup; I’m working on mine now too. Just gorgeous. It’s so satisfying an experience to get a new post from you, with all those beautiful pictures, one after the other, to gaze at. Those of us with very little space thank you! How nice, Vicki! I’m glad to provide you with some “borrowed” garden views. I’m sure you have your own big plans for what you’d do with all this space. 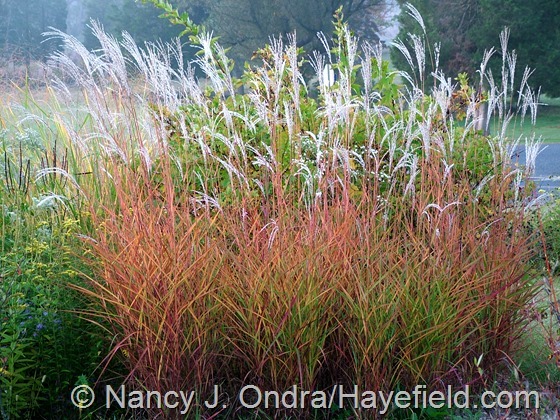 Love the Panicum virgatum ‘Huron Solstice’ and ‘Cheyenne Sky’. They seem like glowing, dancing flames. How dramatic! ‘Cassian’ fountain grass is another favorite. If I can find these locally, I think I may have found some possible solutions to my lackluster Fall display. Thanks for all your work in putting these photos together! Even with all this room, I too really appreciate the plants that offer multi-season interest. 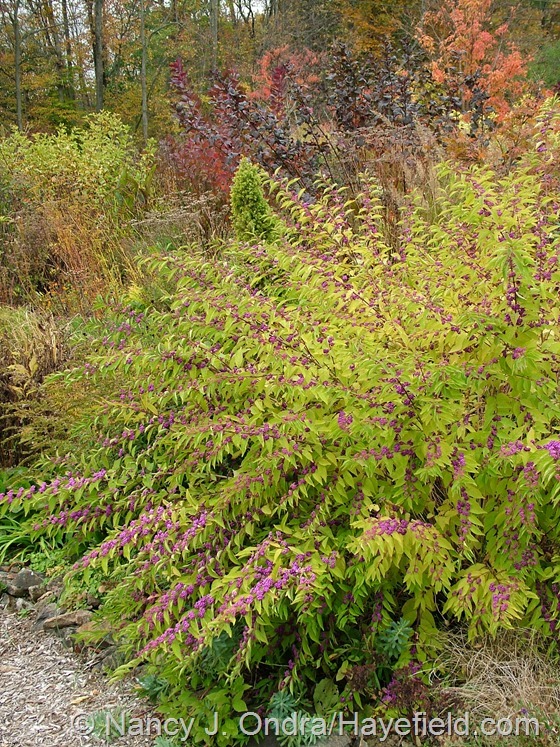 With fall color, some plants are really dependable and others are unpredictable, so the ultimate effect this time of year is always different and interesting. 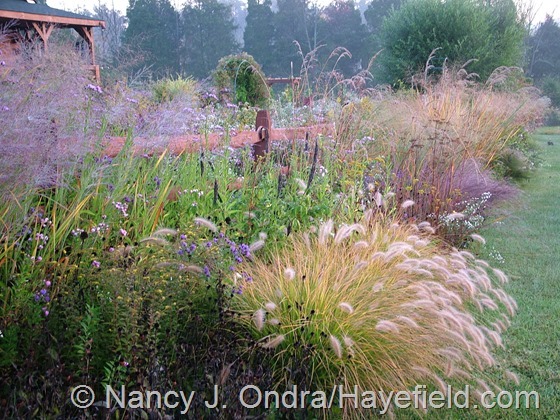 Good luck with finding the grasses for your garden! Hi Barbara! I think you’re just coming into peak color where you are, so I wish you a glorious autumn! Of all the wonderful plants that you show us, I think I have found another “must have”. I like ‘Black Knight’ blue throatwort (Trachelium caeruleum). What a lovely color of purple that would look so nice with any number of colors in the garden. I am always looking for a purple or blue flower to jazz up the scheme. It’s a beauty, Paula, but I found it a real challenge to grow, because the seed is incredibly tiny. The seedlings, too, were tiny and very slow-growing, and the plants didn’t even start flowering until mid-September. The foliage has been gorgeous, though–especially this month–and a freeze didn’t even bother it. If you can find started plants, I’d definitely recommend giving it a try. Nan, I would just love to wander in your garden. Just me and Mother Nature. It looks so peaceful. I hope you do a video again sometime because it made me feel like I really was in your garden. Judy. Hi there, Judy! Thanks so much for visiting today, and for the suggestion. Maybe I’ll try a summer tour next year. Have a good weekend! I so envy the beautiful fall color changes you get in the east (even if I don’t regret the warmer winter temperatures in southern California). 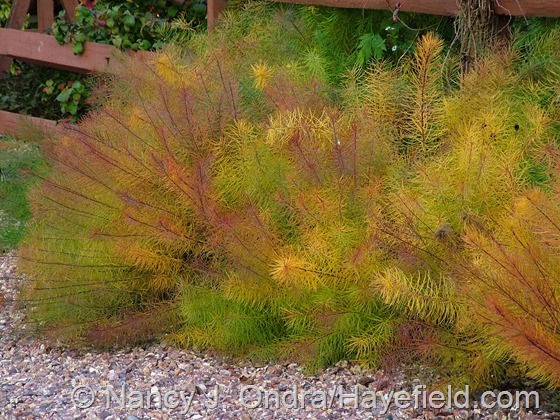 Other than my Japanese maple, I don’t have much in the way of fall foliage color at present. Maybe my Geranium ‘Tiny Monsters’ will take on some red tones as the nights get colder. 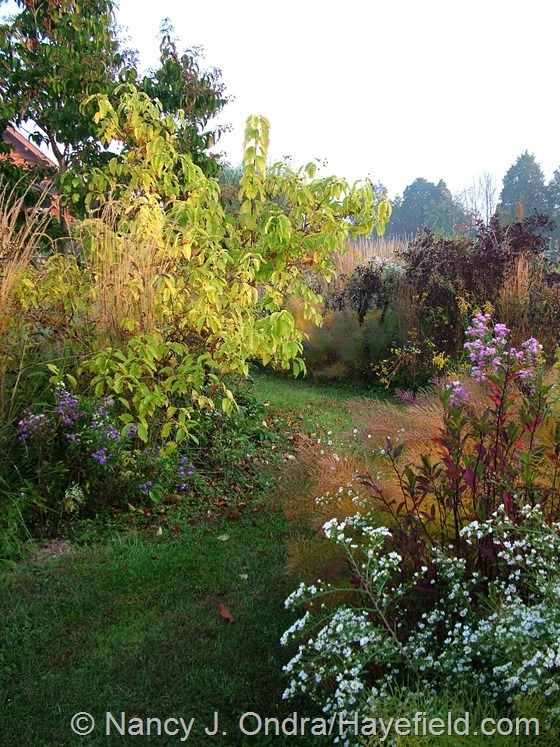 In our frost-free gardens, my own included, there tends to be a shortage of deciduous plants, which probably accounts for the shortage of those wonderful fall foliage changes too. Oh yes, I would think that your milder climate and the fantastic range of plants you can grow would be ample compensation for minimal fall color. I can’t say that I’m not grateful to have a bit of winter rest here, though: those few weeks in January after seed-saving ends and before seed-sowing starts the season all over again. What a delight to hear from you, Ausra. I really appreciate you taking the time to read and comment. I’m grateful just to have people visit, but it’s always a pleasure to make more personal contact with readers, to be able to say hello and thank you. You’ve recently had some epic fog out there too, I think? No wonder your enthusiasm for gardening is a bit lacking right now, Patty. I hope you’re able to get outside and enjoy some sunshine soon! In the meantime, I’m delighted to hear that you enjoy your virtual visits here. Yes, it was epic fog – like being enveloped in a huge cloud of dampness for about two weeks straight! But our more typical rain is about to get its toehold again…. Hmmm…I guess rain *would* be an improvement over that. I wish I could send you some sunshine! It really looks great out there! I can’t believe how big your garden has become outside the fence. How do you handle all the spring cutting back? Are you considering more power tools? The colors and forms are so nice, I bet it’s a joy to walk the paths and be surrounded by the gardens. The mix of fall colors with the evergreens is also such a nice backdrop. I’m looking forward to next month! It’s always so interesting to see that seed list of all your favorites. Thanks, Frank! I do some of the all-perennial parts of those beds with my brush mower when I cut down the meadow, but most of it is just snip-by-snip with my hand pruners, It’s a long process, as you can imagine. I can’t wait to show off the seed list this year! I already have some Ptelea seeds set aside for you; maybe you’ll find something else of interest as well. I am amazed not only by the hard work you put into your beautiful garden, but also by your organizational skills! Hah – just wait until the 15th! Prepare to be wowed (er…I hope you will be, anyway). Isn’t mother nature grand? Those colors…take my breath away. 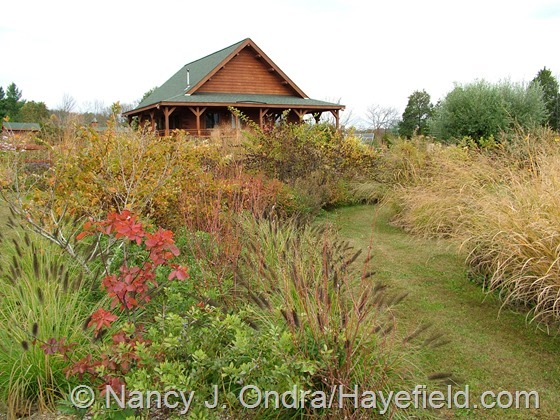 I wish I had room for more trees and shrubs with fall berries….and grasses too. I can’t wait to see what seeds you’ll be offering this year. Would you believe that within 12 hours of putting up this post, the fall colors around here absolutely exploded? Oh well. I may have to do a follow-up fall post at some point. But for now, yes, it’s time to think about seeds! I have Phuopsis seed already set aside for you, by the way. Sure did – and you’re very welcome. wow, just wow! The color combinations are amazingly beautiful. I will spend more time looking at the plants you’ve put together to get some ideas for here! Hi there, Jill! I hope you find some combinations (or at least some inspiration) that will work where you live. It’s a great time to start thinking about next year. Thanks for stopping by! Always a joy to find your post Nan! It’s Spring here in Australia,so I’m surrounded by Roses, Poppies,Iris and other such pretties. They’re gorgeous, but, my favorite season is Autumn. So thank you for a reminder of what I have to look forward to! 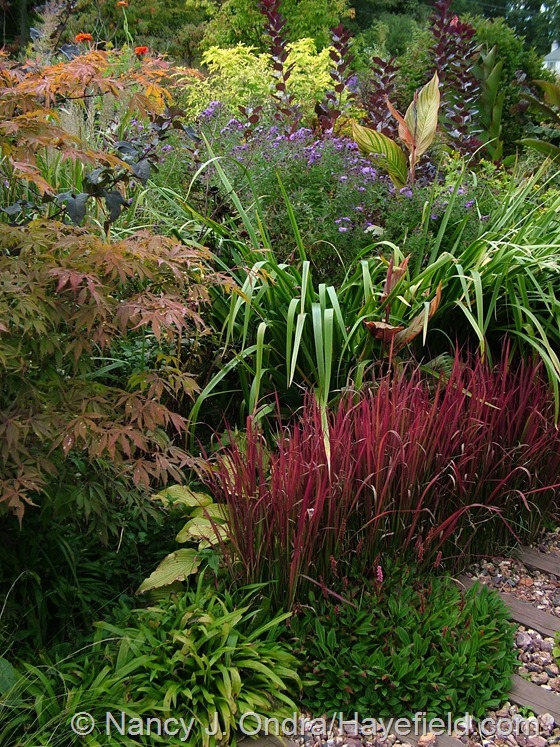 I adore ornamental grasses and also dark and purple foliage. So one of my favorite plants is Pennisetum setaceum ‘Rubrum’. I have divided it up and dotted it around the garden. It looks so good with everything! Thanks for sharing your wonderful garden with us. Happy spring, Jennifer! I too really like the purple fountain grass. It’s not hardy here, but I make sure to pick up a new one each year. You’re fortunate to have a whole new season in front of you. Have a wonderful time in your garden! The second-to-last photo, the front garden, is really something, Nan. 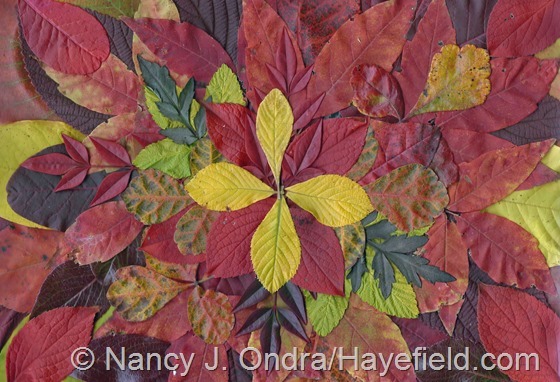 The leaf collages are beautiful–good designs for stained glass. Hayefield looks great all year but, to my eye, its at it’s best in Fall. Well done on the Pawpaws. 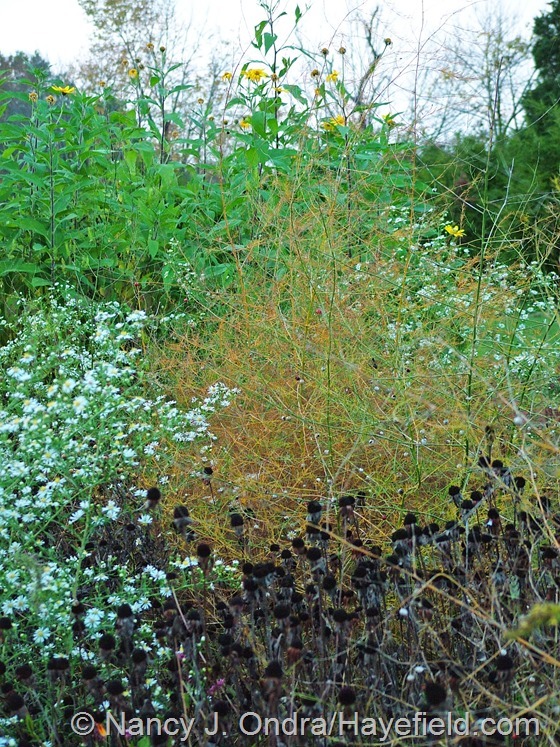 They grow wild in Kansas, though not too common–as you know, they are somewhat exacting plants. At the 17th Annual PawPaw Festival last month, a private event held by a friend, there were pawpaw salads, pawpaw chutneys and preserves, pawpaw mustard (yes! ), pawpaw bran muffins, pawpaw pie, pawpaw sherbert, pawpaw/pecan ice cream and pawpaw creme brulee, all delicious and packed with phytonutrients. To me, the taste and the texture are a blend of banana, mango and persimmon. The pawpaw is the only tropical species native this far North, I believe. A pawpaw party – how fun! All of the goodies sound yummy (um…except maybe the mustard? I’ll take your word for it, though). I’ve only ever had the fresh fruit, but maybe I’ll have enough in a decade or so to try some actual recipes.